Our favourite Montreal pâtisserie has just come out with our favourite new food publication of 2015, and it's perfectly geared for the summer. The concept is brilliant. Start with Stephanie Labelle and her exceptional Pâtisserie Rhubarbe. Assemble some stories, some clever ideas, and a few dozen enticing recipes: some of them sweet, some of them savoury; some of them simple, some of them more involved. Pair this material with the work of three talented local artists to bring it all to life. And, finally, get Montreal publishing & design phenoms La Pastèque to design, package, and, yes, publish the project. The result is Les Carnets de Rhubarbe and it was launched yesterday evening. if you added about 100 enthusiastic people, an alleyway cocktail bar, some snacks, and some beautiful decorations. It's hard to tell from this image, but the books were being sold and signed inside the store. The collection itself consists of 3 themed carnets--little notebooks--that are each 16 pages long, that fold up nicely accordion-like, and that fit perfectly into a stylish cardboard case. The first one tells the story of Pâtisserie Rhubarbe and features Stephanie's favourite rhubarb recipes, including everything from compote de rhubarbe to galette rhubarbe et framboises. The second--Fête de Ruelle--provides instructions for how to throw a successful neighbourhood alley party--one that features homemade popsicles and ice cream sandwiches. 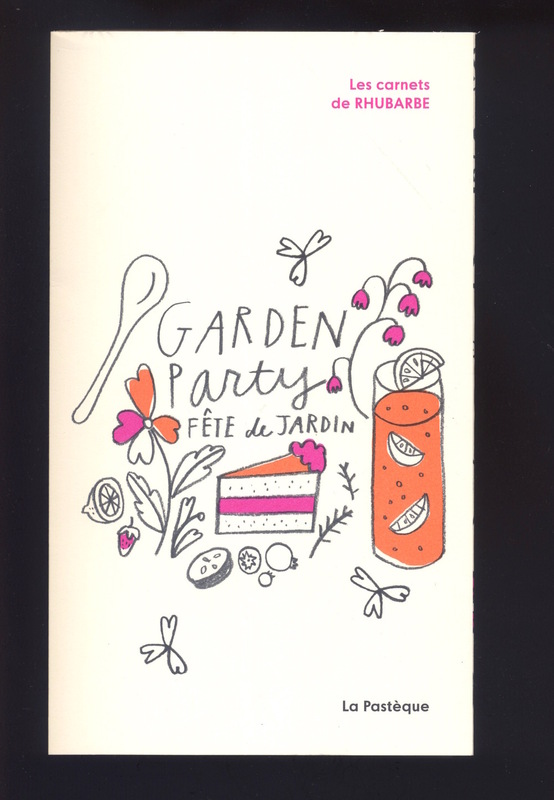 provides helpful pointers and recipes to help you throw a great garden party: cocktails, juices, sandwich bread, sandwiches, cake--it's all in there. And it's really cute. I mean, get a load of these illustrations by the multi-talented Ohara Hale. Les Carnets de Rhubarbe captures so many of the things "...an endless banquet" believes in: food, drink, art, sociability. In fact, in many ways it's a microcosm of all the best that Montreal has to offer, of Montreal at its spirited best. You can find Les Carnets de Rhubarbe at Pâtisserie Rhubarbe (5091 de Lanaudière, Montreal, QC), and anywhere that's wise enough to stock La Pastèque's fine editions. OUT NOW. In a French edition only.